More than 400 Furniture World readers participated in this FURNITURE WORLD Magazine/ www.furninfo.com online survey. More than 400 readers participated in a 2007 FURNITURE WORLD Magazine/ www.furninfo.com survey that asked them to name their most significant delivery problem. They also had the opportunity to add comments. Although warehouse and delivery managers are generally responsible for dealing with problems, improving delivery satisfaction requires attention at every step of the supply chain. This is especially important for employees involved in order administration and product handling. By now, every furniture merchant should know that delivery performance has the potential to demonstrate store-wide commitment to creating an enjoyable shopping experience. A mangled delivery can, in contrast, generate customer misery, anger and ill will. Delivery is the last act of a sale and it plants the first seed for the next sale. That’s why it needs to be perfect. Whether you are running your own warehouse and delivery service or outsourced part or all the services, the customer doesn’t care. Your store’s reputation is on the line. Damage (62%): Survey respondents overwhelmingly noted that damage is their most serious delivery problem. Damage can occur at any point along the supply chain and the warehouse manager is clearly responsible for proper merchandise handling and reporting, starting at the point of receiving. Lacking proper notation of damage at the time of receiving makes it the retailer’s responsibility. Most retailers remove packaging and stage prior to loading the delivery truck. For many stores, this is a point where improvements can easily be realized. Positive benefits result from improved prep area lighting and staff training to make sure that each piece is handled correctly, all necessary parts are included, and each piece meets customer expectations. 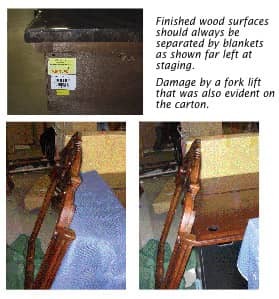 When damage is noted at the customer’s home by a driver team responsible for wrapping and loading furniture, an immediate call should be made to customer service. An immediate decision should be made regarding whether to return the piece for repair, replacement or to send out a service technician. Incomplete Orders: Orders not shipped complete were identified by 11% as their significant problem. While this is sometimes a manufacturer’s shipping problem, it is frequently caused by control lapses in retailer’s warehouses. A good location system and careful attention to product and location status is the solution. Used correctly, warehouse management systems and cycle counting minimize inventory surprises. Proper uses of these systems also help to control warehouse shrinkage due to theft. Customer Error: Customer error was cited by 8% of FURNITURE WORLD readers. This situation can often be reduced at the point of sale. Your sales staff should be responsible for clearly explaining product features so that customer expectations are in line with what they will encounter at delivery. Natural variations in wood grain and leather should be discussed. A few questions about impediments to delivery such as elevators, narrow doors and hallways can help to reduce problems later, especially when purchases of large pieces are being considered. Encouraging customers, where possible, to bring room dimensions and having sales associates do room sketches can also help to reduce customer errors. Wrong Item Shipped: Wrong item shipped (6%) is clearly a warehouse issue that can be improved by process and training. Typically there are at least three people looking at the piece for picking, prep and truck loading. Best practices can be manual or bar code based. There isn’t a reasonable excuse for delivering the wrong item. My preference is for the bar code label to travel with furniture from receiving through delivery. If a piece is rejected, the label speeds reconciliation. Rescheduled Delivery: Rescheduled delivery was also the most significant problem for 6% of participants in the survey. Minimum handling results is the best chance for a perfect delivery. Learning about a delivery cancellation is far more costly after the truck has left the dock. Even with skilled packing, traveling with and re-shifting a cancelled order can result in damage as well as lost time and truck cube capacity. Occasional rescheduling may also be caused by delays at prior stops or by loafing delivery teams. If this is a problem in your operation, work to improve communications with customers by extending calling hours, offer a 45 minute call ahead and monitor the performance of your delivery teams. Also, if you must cancel a stop, promptly notify the waiting customer. Sales Errors: Sales errors and Miscellaneous issues were tied at 4% each. Experience has shown that when retailers identify and work with the problem members of their sales staff, they will get immediate results. Miscellaneous problems like road closures and weather can’t be avoided and unfortunately can only be handled to the best of your ability. An exchange costs five times the original delivery cost and frequently exceeds the margin on any given order. Returns and cancellations can devastate your bottom line because you lose the sales revenue but incur logistics costs for the initial delivery, return costs and the wrath of the unhappy customer who looks elsewhere. In the worst case scenario, the product is damaged along the way and has to be scrapped. The message is clear. Invest in your people and processes to do the job right the first time. Owners and managers must make the time to walk the warehouse and dock, look at the merchandise and motivate employees at all levels to not accept anything less than a perfect delivery.